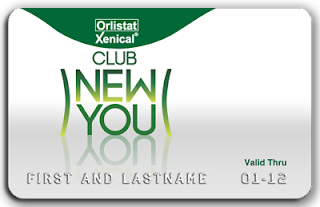 FREE Xenical at Club New You ~ Philippine Freebies, Promos, Contests and MORE! If you are looking for a holistic and effective weight-loss plan, then Club New You is perfect for you. The program offers to give a pleasant and engaging experience both to you and your loved ones. To join, complete the registration form available in leading drugstores, doctor's clinics, Xenical events, Club New You website, or by calling the Xenical hotline at 553-XENI (9364). This will give you full access to their website wherein you can take advantage of weight management tools such as the BMI tracker and calorie counter. In addition, you will be given a membership card, which you can use to avail promos from the merchant partners. Register and activate your membership until July 15 and get FREE 1-week supply of Xenical.